“ALFA” stands for “Anonima Lombarda Fabbrica Automobili” – the name of the very first plant, which was acquired by Cavalier Ugo Stella in 1910. At that very moment, Alfa Romeo history started. Cars made by this Italian brand are famous for sporty driving characteristics and passionate styling. They started to appear in the US in 1950s. Alfa Romeo has been a part of Fiat Chrysler Automobiles since 1986. Italian company’s racing resume is impressive. It includes 5 world championships and 4 Le Mans, over 15 European Championships and more than 10 Mille Miglias. The first version of Alfa Romeo logo was created in 1910 by Romano Cattaneo, who was inspired by the emblem he had noticed in Castello Sforzesco. The board approved his sketch, and Cattaneo was entrusted with making final design. This logo includes two heraldic elements associated with Milan, where the automaker’s history started: a red cross (symbol of Italian capital) and the biscione (comes from the coat of arms of the family that ruled Milan seven centuries ago). Originally this badge was made of enameled brass and had a round shape. In 2015 an all-new emblem was introduced. This logo, designed by Robilant Associati, differs from the original one in colors (green, red, dark blue) and typeface. Also, you can notice a silver textured background, which has replaced white and light blue field. Company’s symbol is a quadrifoglio (green cloverleaf with four leaves) placed into a triangle. It can be spotted on Alfa Romeo racing cars since 1923. Since the 1940s, it appeared only on the upscale autos. In most models, it is placed on the side panel of an auto or on its front wings. 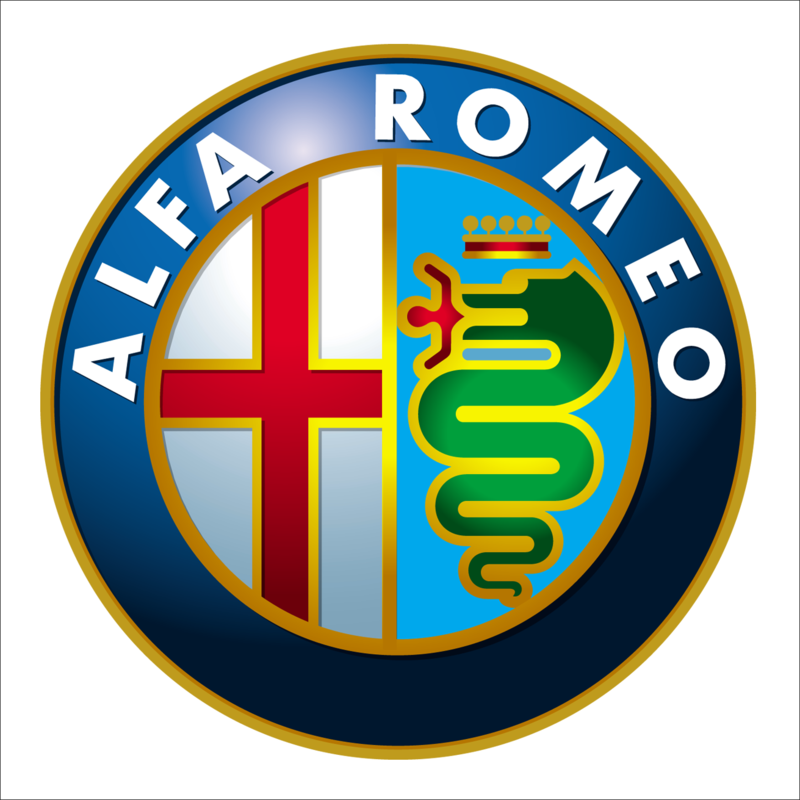 In 1925, following Alfa Romeo’s victory at the first World Championship, a golden laurel crown appeared on the company’s logo. It stayed there for over half a century. In 1982, the company’s designer team decided that the laurel crown should be removed. In addition to this, one more change was introduced simultaneously: the diameter of the logo was increased. Every element of the emblem has its specific color, from the Red Cross associated with Milan and crusaders to the green snake. Due to the use of two shades of gray the logo has a 3D contrast of illumination and shadows. The machines that made emblems were destroyed during the World War II, so in 1946 a single-color version was created. 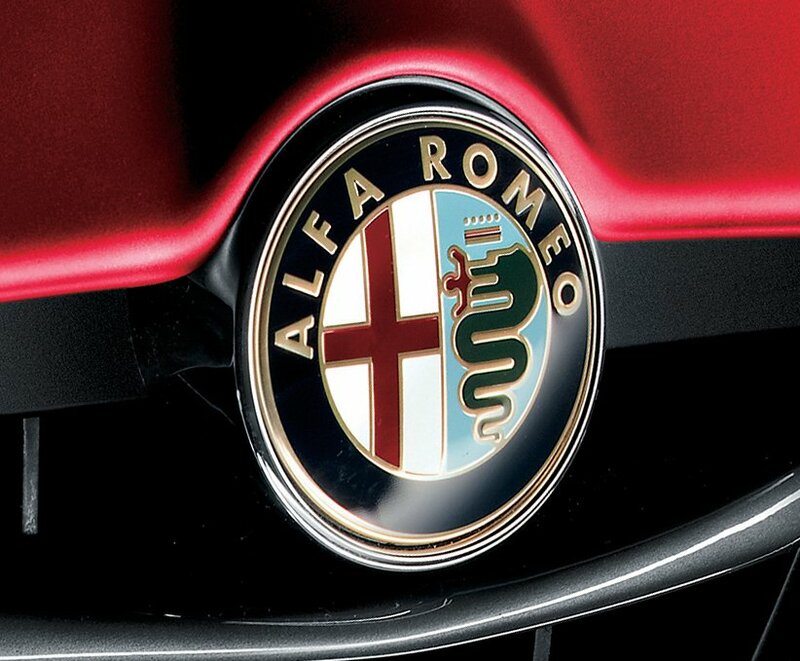 It was used until 1950 when every color of the Alfa Romeo Logo returned to its place.